Our Best Friend, the Dog, has been around for thousands of years. When man learned to harness dogs for his use, there began the creation of an unbreakable bond that would grow and last forever. As man’s livelihoods and needs diversified, so did his need for different types of dogs. When men took to the road to conquer new lands, in search of treasures, they depended on dogs. Among the jobs assigned to man’s best friend were herding and protecting their livestock which traveled with them for food, protect the men and their goods and hunting. As men continued in their travels, some dogs remained in the lands they passed through and bred with native dogs. That was the beginning of different types of dogs. As time passed, men observed the behaviors of certain dogs and decided they wanted to encourage these behaviors. They began breeding programs with dogs of similar or diverse characteristics depending on their needs. These programs resulted in the many breeds of dogs today. March’s dog is the Alaskan Klee Kai. 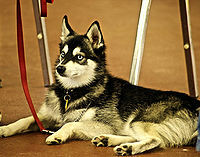 Alaskan Klee Kai (means “dog little”) one of the newer breeds, it looks like a smaller version of the Alaskan Husky. How dangerous is Tramadol for dogs? Bad Reaction to Doxycycline and Fish Oil? Will you send a link or reference our new comprehensive article on Dog diarrhea? can a city come in & take& kill my babys bcause i have 2 many 2 suit them? can I give my dog both siloxane and tramadol?